2017 is a fresh and brand new year for footy and me. Women’s AFL starts and it’s the year for me to make my dreams get much closer to reality. While St Kilda are on the waiting list on the AFLW, my passions of supporting girls are towards the Bulldogs. The mighty Bulldogs’ first opponent is Fremantle, in the situation where is the same as Bulldog boys in 2016. It is exciting for me. Before the match, I have a job interview at a hotel. Like footballers I guess, I am nervous at the interview. But I have to do the very best like as in the Doggies club song, in order to get more money to move to the next life chapter in the UK later in 2017. I hope I show efforts to work for them. During the interview, I mention the manager about my contributions here and tell her that I will be happy to write articles in English to oversell the hotel. After the interview, I enjoy riding a bike to a cafe where an international meet up is held every Saturday. Also warm weather is joy. While Whitten Oval is packed with passionate footy supporters, the meet up is quiet with only four spectators. As the distance is far away between the stadium and here in Kyoto, as well as towards my next destination in my life, I am unable to watch the game live. But my efforts of supporting seemed to have delivered to Bulldog girls. Just after the first bounce, Davidson (Fremantle) attempts diving into the ball to take a mark but misses and is tackled. Then picking the fumbled ball within the goal pocket, McLeod of the Bulldogs runs in open space and kicks the first goal in the match. In my perception, tackles in women’s footy are different to boys. At the first quarter, girls tackle attempting to catch a ball with forming a group first. But they end up falling down on the ground as if a small building has collapsed. It excites me with interests. Both clubs score one goal each at the first quarter by Caulfield (Fremantle) and Lambert (Bulldogs). Both teams tackle beautifully at the beginning of the second quarter. Girls show passions and are so brave. Birch kicks the ball towards the goals 30 metres away, but the ball allows the defender to be caught in the goal square. The Doggies miss an opportunity to gain six points. Then the top Dog Brennan takes a quite high mark and kicks a goal from just 45 metres away (the number is only my guess) as her first one as an AFLW player. After the main break, kicks in the goal square are worked out and O’Connor kicks a goal for Doggies. Then throw in from the boundary line close to the goal posts, the ball is fumbled and finally caught by Blackburn who controls the congestion well in order to score the second goal for Bulldogs at the third quarter. At the last quarter, Gardener is awarded with a free kick because she is high tackled. Then she kicks well towards her ‘supervisor’, Katie Brennan. The captain shows good kicking skills towards the goals. Six points are given to the Dogs. Girls’ efforts and braveness are great to see. New footy is so attractive to footy fans. I would go to the stadium if I were in Melbourne. Western Bulldogs: Brennan 2, McLeod, Lambert, O’Connor, Blackburn. Enjoy supporting the Western Bulldogs Yoshi, they are a terrific club and have always been trailblazers in Women’s Football. St Kilda are not likely to be in the AFLW until 2019, so you will have plenty of time to learn the words to the Bulldogs song and enjoy singing it in victory! Good to have you on board for at least one of our footy teams Yoshi. It would be good if St Kilda had a team next year. Do you know any details? 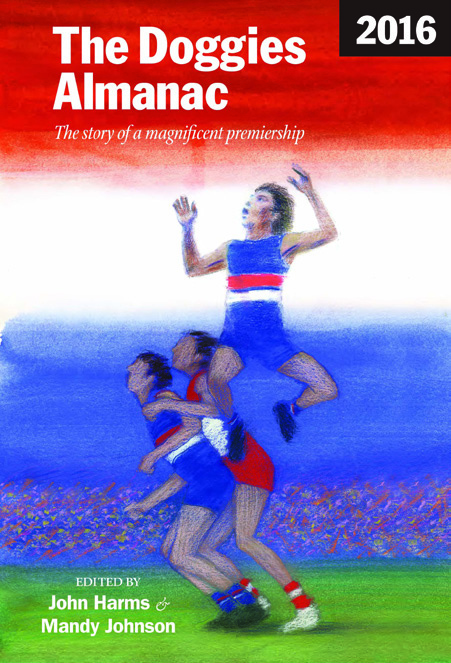 Looking for reasons for the Bulldogs success last year with their three teams, the fact that they play out of Whitten Oval (two teams) and all train together at that base is never mentioned much., but it is important. The club is very settled in that way. If the Saints can have the AFL side, the VFL side and eventually the women’s team all based at Moorabbin it can only be positive for the club’s future. Like me you hsve to wait for a new footy team. Nadae – Haha. Actually I had already known the lyrics of the club song. Even I sang Sons of the West when the Bulldogs won but not against St Kilda. By the way do we have to say “daughters of the west” instead of “sons of the west” for girls’ team? Neil – We won’t have a women’s team at least by 2019. As we hired a first female coach in the AFL story, we should be approved to be in AFLW. It’s interesting to know three clubs trained together at Whitten Oval. To be honest I have heard Bulldogs girls trained together with Bulldogs boys, but I didn’t know Footscray boys did too. Cat – Thanks for your compliment on my story. Yes we hope to have all 18 women’s team in the future. Then the league will have more spectators. And girls will be full time footballers.